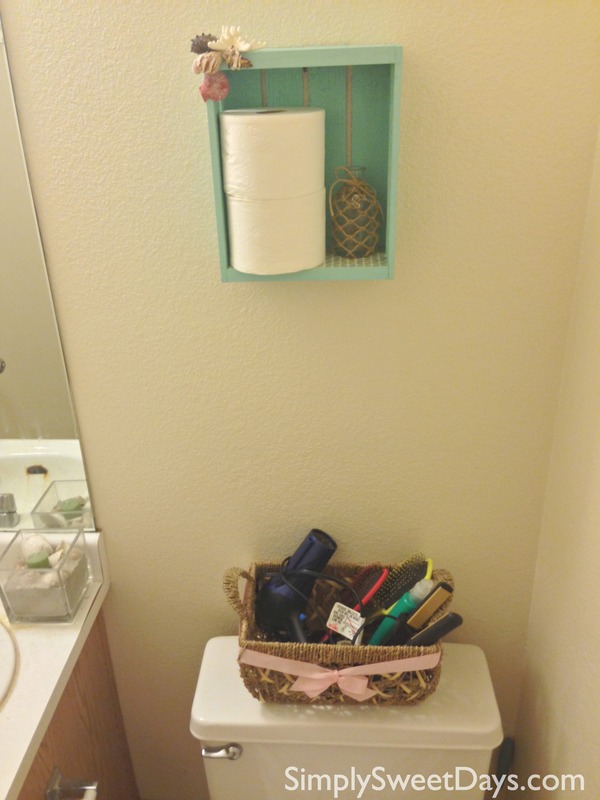 I finally took the plunge and simplified our bathroom organizer and replaced it with a pretty, DIY toilet paper holder. It was a lot of fun to make, and very easy! All it took was some paint, a crate, and some decorative shells. 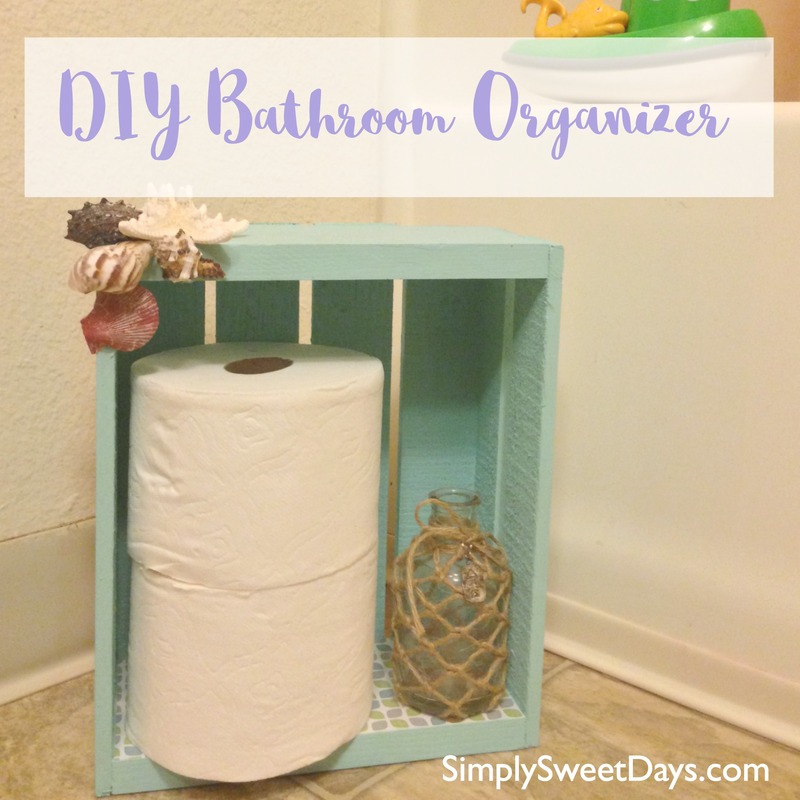 Finding a good bathroom organizer can be tricky when you live in a small home. 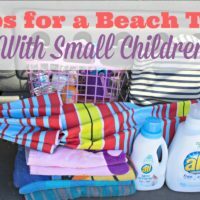 We used to have used a tall, narrow shelf/cabinet piece in our bathroom for many years. Unfortunately, a few weeks ago it broke! This was probably for the better, because it was becoming a catch-all for hair ties, half-empty shampoo bottles, clips, razors, and about a zillion other toiletries. 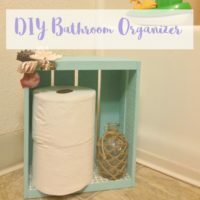 I’ve always wanted to do some sort of DIY crate shelf/organizer for the bathroom, and it seemed that now was the time. First, give the crate a good coat of paint. I left the interior base alone, since I knew I would be covering it with contact paper. 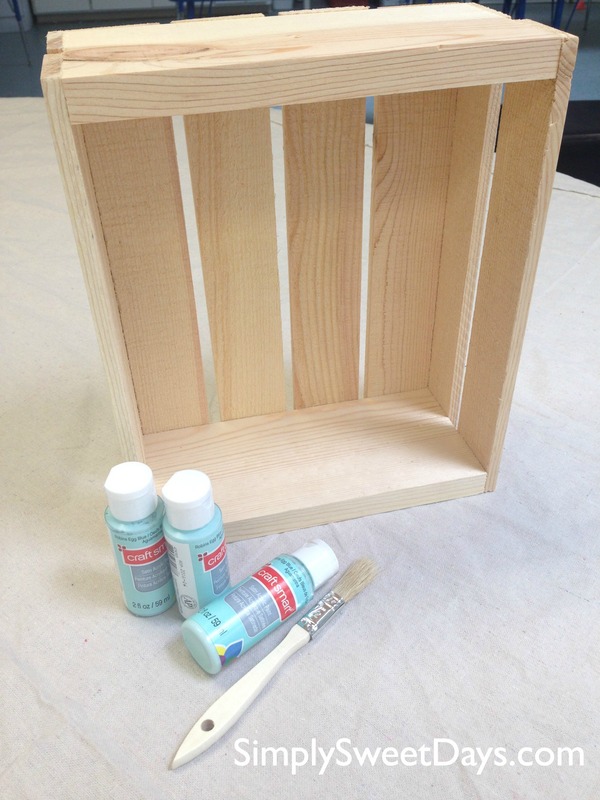 Let the paint dry and add a second coat to any streaked sides. Measure the interior base of the crate to see how much contact paper you will need. My carpenter friend always says measure twice, cut once! Next, carefully cut out and stick on the contact paper. Puncture any bubbles with a pin and smooth them out with a credit card. Use a hot glue gun to attach some seashells to the crate. After much debate, I decided to go with a “cluster” arrangement for the shells. My artsy friends advised me to start with a large shell, and arrange the smaller ones around it. I think I might still add a few sand dollars to the back wall, so they show up when you take the top toilet paper roll out. I tried out my little bathroom organizer and toilet paper holder on the floor in the upstairs bathroom. In the end I thought it would work best in the main bathroom as a shelf. My little guys splash in the bath too much to have this cute crate near the tub! It turned out that this crate is the perfect size for the toilet paper that we use. With Baby John starting to use the potty (*gasp! My baby is potty training! *), the Quilted Northern® Ultra Soft & Strong® with Cleanstretch (9 Mega Rolls) is just right for a big family like ours. I like keeping a few rolls of toilet paper where people can find them so guests don’t get caught in one of those embarrassing “these folks are out of toilet paper” situations. We get our Quilted Northern® Ultra Soft & Strong® with Cleanstretch from the Walmart Neighborhood Market, but you can also find it at Walmart online and pick it up at a Walmart location near you. 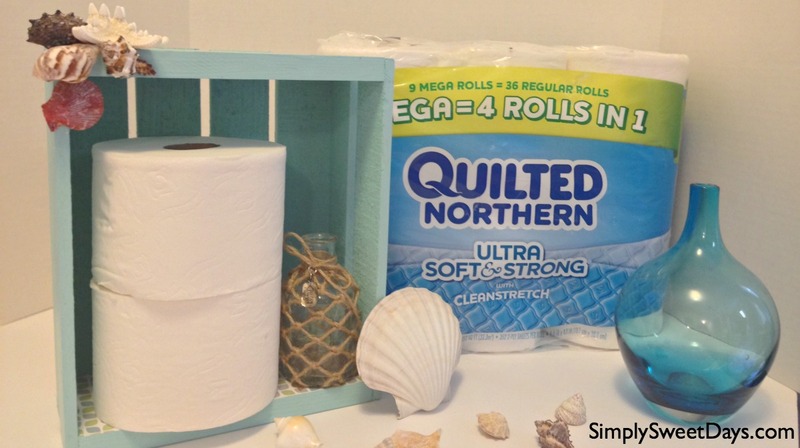 What do you think about combining a cute DIY bathroom organizer with Quilted Northern® Ultra Soft & Strong® with Cleanstretch to keep your bathroom organized and #MegaPrepped for guests? Thanks for stopping by! 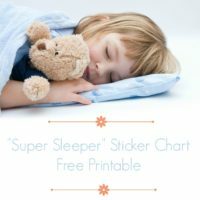 Be sure to follow along for more ideas, and grab your free printable calendar template as a thank-you! 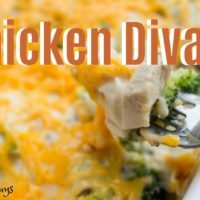 Love a great DIY and one that has a fun theme! 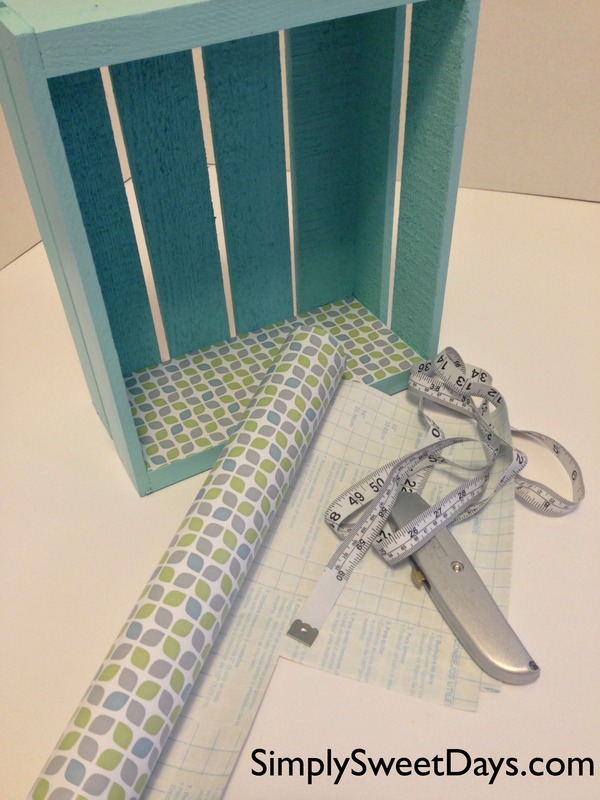 The beachy theme is so me- and love how easily you described how to create this organizer! That’s such an awesome and useful DIY! I wouldn’t mind making one for our bathroom as well, especially since it’s perfect for holding different items. What a cute way to decorate your bathroom. I am loving the beach theme. This is a cute addition to your bathroom! 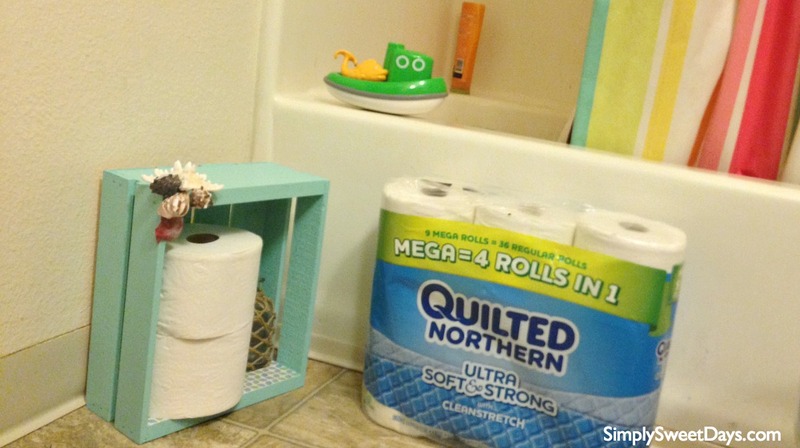 I like that it’s a shelf now, to keep the toilet paper out of the way of other things in the bathroom. I usually stash my extra TP under the bathroom sink. This is such a cute craft! I need this in my bathroom to make things more organized. Any thing that helps the bathroom look prettier is great by me. I need to do this for my bathroom. That is cute and I love the color. I really want to make over our home in coastal colors. I started with our Master bedroom and bath so it would go in there. Great idea. Looks like it would work great in a beach theme bathroom. Kids could also do this project. What a great way to dress up the bathroom. I love this because even though yours is beach-themed it can really be altered to fit any bathroom. Your DIY is so cute and very easy to do! Thanks for sharing! If I created one I would definitely embellish it with seashells and other mementos of the beach! Looks like the place to sit stuff is too small. Plus if u stack them u could make some nice shelves. Just a thought .